Robbie Clement was born near the Tomorrow River in the Tomorrow River country of Wisconsin. He was raised in a musical family and began making music at an early age. Folks who knew him back then say Robbie was always entertaining. Audiences say he was born to be on stage. Robbie is a variety folk entertainer who’s “have fun, will travel” lifestyle makes him a man you don’t meet every day. His dynamic performances combine music, comedy and storytelling with guitar, banjo, dulcimer, limberjack, jawharp, and audience accompaniment. Robbie’s ability to share his music with an irresistible sense of fun attracts people to him like a modern-day pied piper. Audiences love him for his ability to sing a song “inside-out,” so that they can see and feel what he is singing about. Wherever he performs, Robbie makes music magic by sharing it in the time-honored way: friend to friend and heart to heart. His upbeat songs and unique brand of “creative silliness” have made him a special favorite of children throughout Tomorrow River Country (and beyond!). Robbie’s songs have been showcased on many Midwestern radio and television stations, and been aired on Public Radio across North America. 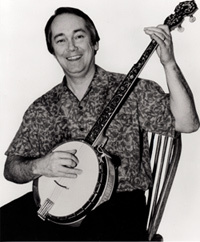 He is the author of an internationally published series of guitar and banjo books, as well as a book of original songs. Robbie is the founder of Tomorrow River Music, an artists’ collective and recording company. He is the builder of America's finest jawharp. His Whitlow Jawharps (named for his mentor Fred Whitlow) are handmade and tuned to pitch with a lifetime guarantee. His critically acclaimed recordings include Like a Rose That Blooms in Winter (Midwestern Folk Album of the Year! - KCR, New York City), Heartland Home, The Magic Place, (Parents’ Choice Award! ), and Something Special (Children’s Choice Seal of Approval! ).